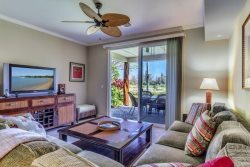 Waikoloa Beach Villa in Hawaii with 2 Bedrooms, Swimming Pools, Hot Tub, Fitness Rooms, Close to Beaches & More! This delightful Waikoloa Beach Resort Villa is in a perfect situation for exploring the tropical island of Hawaii. A tremendous retreat for friends and family, this cozy villa accommodates up to four guests and features two bedrooms, two full bathrooms, and is sprawled out over 1,200 square feet. The living room is cozy and opens on to a protected patio, equipped with a barbecue and dining area. The exquisite mountain view and back yard lounge make this unit enchanting. The indoor and outdoor dining area seats four with additional seats for three at the breakfast bar. The lanai opens to expansive grassy area. The master suite features a king-sized bed and leads into a crisp, contemporary bathroom with a glass shower, double sinks and a luxurious deep-soaking bathtub. The guest bedroom offers two twin beds and has its own entertainment center including a flat screen TV. Also included: air conditioning, washer/dryer, complementary parking and complimentary WiFi. Unfortunately, we do not allow pets. Enjoy an unbeatable awe-inspiring view of the beautiful gardens and manicured lawns with two swimming pools and two hot tubs while relaxing and reconnecting with family and friends. There is also a fitness room with top-of-the-line workout equipment. All of our units have informative guidebooks to help you get the most out of your stay. Waikoloa Beach Villas are an easy to find, perfect island hideaway. The Beach Villas are located across the street from Queens' MarketPlace and next door to The Kings' Shops, a quaint shopping destination complete with art galleries, a gourmet grocery store, clothing boutiques and some of the best dining available such as Sansei’s Steak and Seafood, Aloha Bar and more. They also have a convenient food court with “upscale fast food” such as Lemon Grass. Here at ResorticaHawaii.com we truly “Live Aloha,” and hope to share it by welcoming you and yours to paradise.